Magento Imagine 2018 Master of Ceremonies, 3x Magento Master, 5x Magento Certified, 15 years of experience creating unique online customer experiences, organizer of the Magento SoFla Meetup, host of Nomad Mage and host of podcasts Magetalk, Future Commerce, Merchant to Merchant, and SD Office Hours and if you’re still reading this; what do all of these awards, activities and accolades have in common? They all belong to Mr. Phillip Jackson. That was a long way of saying (and tooting Phillip’s horn) that SD’s Phillip Jackson, our Ecommerce Evangelist is the official Master of Ceremonies at the 2018 Magento Imagine Conference. Please join us in congratulating Phillip for this tremendous honor to host one of (if not the largest) ecommerce conferences in the world. If you’re not familiar with what Magento Imagine is, it’s one of the largest ecommerce conferences held by one of the largest ecommerce platforms, Magento. It’s a place where thousands of individuals who are passionate about ecommerce and innovation get together to share their stories, experiences, and expertise of Magento. If you’re interested in sponsoring or attending make sure you sign up soon! Magento Imagine will be held in Las Vegas at the Wynn, April 23-25. 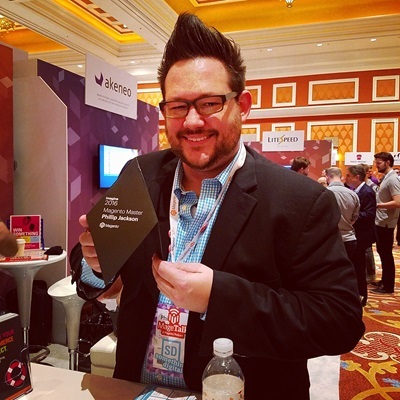 Make sure you check out the full interview with Phillip on becoming the Master of Ceremonies and a pretty funny video featuring Magento CEO, Mark Lavelle. If you liked this blog make sure you check out our recap from Magento Imagine 2017.